The University Building in 1891. Courtesy of the New York University Archives. A researcher first digging into the history of the University Building might wonder if women could only enter as servants or in masculine disguise, like the titular character of Cecil Dreeme, the 1861 gothic novel set in the University Building. The University of the City of New York did not admit women students for most of the time it was headquartered there. The building’s most famous residents—Samuel F. B. Morse, Samuel Colt, Winslow Homer—were all men. Did nineteenth century ideas about men’s and women’s separate spheres truly mean that all women were excluded from the University Building’s intellectual activities? While that may have been the intent, the reality was more complicated. Dorothy Catherine Draper is the first woman most accounts of the University Building mention by name. In 1839, she posed for one of the first clear daguerreotypes taken of a human face. Tradition holds that this took place on on the roof of the University Building. Professor John William Draper, Dorothy’s brother, took the portrait. Despite being an educated woman herself, Dorothy was admitted to the University Building because her brother escorted her there. No other record of her visiting the building exists after the day her earnest face was immortalized among the earliest examples of American photography. More women gained access to the University Building in 1860, when the Woman’s Library opened on the third floor. 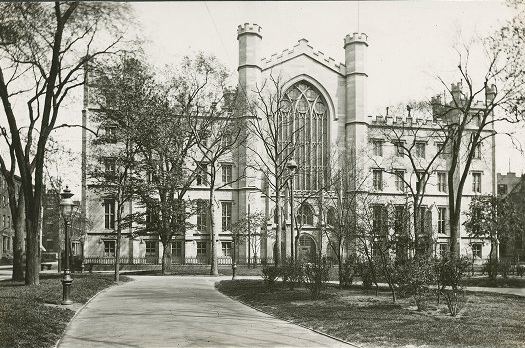 The New York Times reported, “On Saturday the Woman’s Library was crowded with ladies, and the pleasure and satisfaction they seemed to feel in having a handsome institution of this kind for themselves, were not only plainly apparent, but eagerly expressed.” This was the first time women were admitted to the University Building to pursue their own studies: the University of the City of New York would not accept them for another thirteen years. The Woman’s Library was developed as a philanthropic project to let working class women access books that would improve their minds, further their educations, and help them find employment that paid more than “starving wages.” It was a subscription library, but membership fees were relatively low. Members paid $1.50 per year, though women unable to afford that fee could join for free. The Woman’s Library also had some notable advantages over other libraries in the area. The Astor Library was free, but its books did not circulate, and it closed half an hour before sunset. The Mercantile Library opened to women beginning in 1854, but membership cost between two and five dollars per year, and the Apprentices’ Library was not open to women until 1862. Critics pointed out that the Woman’s Library was not much use to the truly destitute. As Elbert S. Porter, editor of the Christian Intelligencer, put it, “It is difficult to see how [the Woman’s Library] will materially help the ‘poor sewing girl’ who must work all day and late in the night to get twelve cents for the making of a dozen capes or fifteen cents for the making of a pair of pantaloons.” Perhaps in response to this argument, the Woman’s Library subscribed to a dozen expensive Parisian fashion magazines. Members were allowed to cut patterns from them. Whether these magazines helped “poor sewing girls” to command higher prices for their work, or simply allowed middle class women to improve their own wardrobes, is not clear. The Woman’s Library moved out of the University Building in 1865, and was taken over by the Working Women’s Protective Union in 1866. Subscribers to the Woman’s Library provided the University Building’s population with some variety in gender. However, there is no documentation that they mixed with the college students and lodgers who also occupied the building. The Woman’s Library could thus exist in the University Building without significantly disrupting the separate spheres. This is not to suggest, however, that the spheres remained undisrupted. An artist by the name of Mary L. Stone rented a studio on the third floor of the University Building in 1863. At first glance, her placement on the third floor might be interpreted as an effort to contain women in one area of the building, but it is more likely that she chose the studio because it was next door to that of her teacher, Edwin White. In doing so, she followed the footsteps of artists like Daniel Huntington, student and University Building neighbor of Samuel F. B. Morse, who twice served as president of the National Academy of Design. 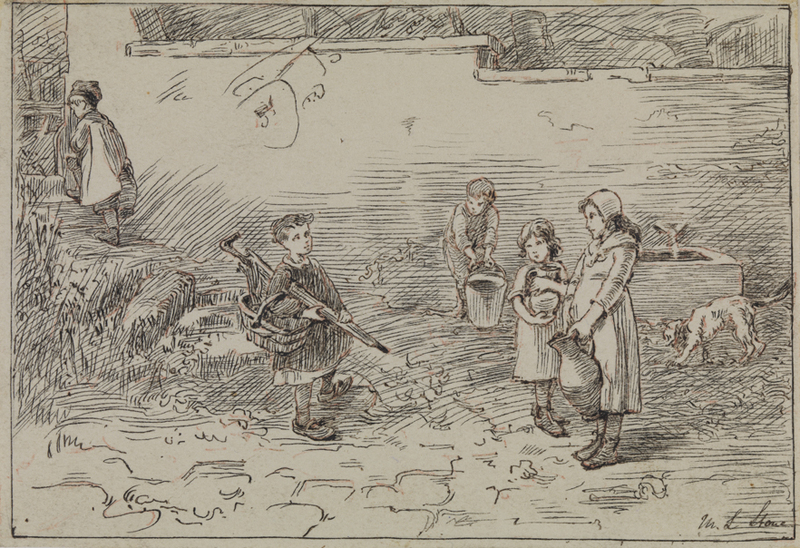 “Village Children,” by Mary L. Stone. Courtesy of the Pennsylvania Academy of Fine Arts. Stone’s identity as an artist helped her straddle the line between traditional feminine accomplishment and middle class masculine professionalism. Art was among the more acceptable educational pursuits for middle- and upper-class women in the mid-nineteenth century. In fact, when women were first admitted to the University of the City of New York in 1873, it was the only subject they were permitted to study. The other artists in the building may have raised an eyebrow at Stone renting a studio, but women artists were not a new concept to them. Her association with Edwin White also granted her legitimacy. Yet Mary L. Stone was a woman who directed her own career, and her decision to work in the University Building alongside other serious artists was ultimately her own. It was a brave choice, and one which seems to have paid off, at least in her lifetime. For the past century, though, her name has been omitted from the lists of artists’ names who lived in the University Building. It is time for that to change. In the twenty-first century, it is time to replace Mary L. Stone among her historical contemporaries. Like the rain and snow which frequently found its way through the University Building’s poorly-constructed tin roof, women found their way into the building’s history despite considerable barriers. The stories told in this post are, admittedly, footnotes. But they are footnotes because they were not considered important enough to be recorded and preserved at the time these women lived. Taken as a group, they shed light on the ways women in nineteenth century Greenwich Village negotiated social norms and their own educational desires—and that is an excellent topic to study. Draper, John William—history of photography. Archives H subject files; New York University Archives, New York University Libraries. Sandra Roff, “A Room of Her Own: The Woman’s Library, a Footnote to New York City Library History.” Information & Culture: A Journal of History, Volume 49, Number 4 (2014), pp. 450-468. http://dx.doi.org/10.1353/lac.2014.0017. “Libraries.” Trow’s New York City Directory. Vol. LXXVIII. New York: John F. Trow, 1865. p. 26. https://books.google.com/books?id=hY4tAAAAYAAJ. The New York Times, various issues, 1858-1861, 1881. University Building—original correspondence from tenants, 1920s and 1930s; Buildings Collection; RG 1; Box 17, Folder 3; New York University Archives, New York University Libraries. “Literary and Artistic.” The Ladies’ Repository. Vol. 39. Boston: The Universalist Publishing House, 1868. pp. 398-399. https://books.google.com/books?id=H4gUAAAAYAAJ. Horace J. Rollins. “American Artists.” Studio, Field, and Gallery: A Manual of Painting for the Student and Amateur. New York: D. Appleton and Company, 1878. pp. 191-195. https://books.google.com/books?id=Wdc4AQAAMAAJ. Eugenia Hughes was an artist living in Depression era Greenwich Village, struggling to find work, a place to live and creative inspiration. A self-proclaimed”flapper” and “victim of the Prohibition and Flapper Era, the gay 20s”, she came from a comfortable background and was used to living a somewhat glamorous lifestyle. That lifestyle changed when Eugenia moved to the Village during the Depression to live with her father, also an artist. She fell comfortably into a group of artists with shared experiences and similar goals, who supported each other financially and creatively. During her years in the Village, the main subject of Eugenia’s works are depictions of the world around her; of the strife she and her friends were experiencing themselves. Eugenia was not an outsider documenting the Depression in the Village, but was affected by it herself, and inspired by what she saw around her. Eugenia’s sketches and drawings shed light on to the often forgotten or lost story of an everyday artist in Greenwich Village.